Well, it’s nearly upon us, Sanfermineros, so ¡ya falta menos! to the lot of yuz, and welcome to one more of Pinks’s Pulitzeros, (prize winning writing it ain’t!) and probably the last one before fiesta, to hoof, as Mr. Testis and The Lokos de Kukuxumusu are getting a bit busy now that the Escalera has hit the 6th of the 6th, and the countdown to Fiesta is truly upon us and about to send our planet spinning off its axis. A quick thanks to my recent Comrade-In-Plants, Pistol Pete, aka Hawkeye, aka Pokero Pedro, for the inspiration for the title of this particular Bullitzer. Before I properly start, though, here’s the first paragraph (slightly abridged) of a well-known book. Well, with apologies to Hunter S. Thompson and his ‘Fear and Loathing in Las Vegas,’ for me it’s not around Barstow, but somewhere around March, though, near the end of the eight month calendar drought since San Fermin finished that the fiesta drug begins to take hold once again. At the beginning of that month, as step number three of the Escalera countdown to San Fermin hits us on the third of the third, well, that for me is when fiesta really catches me by the cojones. And instead of the sky being full of huge bats screeching around, hope, joy and happiness abound because fiesta is ever quicker approaching. Good cheer and joking in Pamplona: Heinz and Hans, circa the 19th century, with the Peña Irrintzi off to the corrida. As I wrote in a review last year, I love that. (And it’s a bullrocking good book, too, well worth spending the sponduliks on.) ‘We hear the whoosh. It sings to us.’ That is exactly how fiesta feels to me, and always has. It did when I first walked into the square on July 6th, 1984 and I could feel my world spinning gloriously, wonderful out of control as San Fermin sang to me, and I felt that whoosh and I still feel it now. Bill Hillman in his most recent, and heartfelt book, ‘Mozos,’ although he was describing waiting for the encierro to start, wrote: ‘The brilliant morning sun struck me like a warm wave.’ Lovely. Well, every single day fiesta strikes me like that, and its warm wave may not whoosh over me, but it certainly washes over me and cleanses and uplifts my soul. So for those of you who have never been, and hence the point of my rather bad pun as the title to this piece, (and there are more coming up) Pamplona is full of cheer and joking, and song and laughter, and old friends and new friends, and so, so much more. 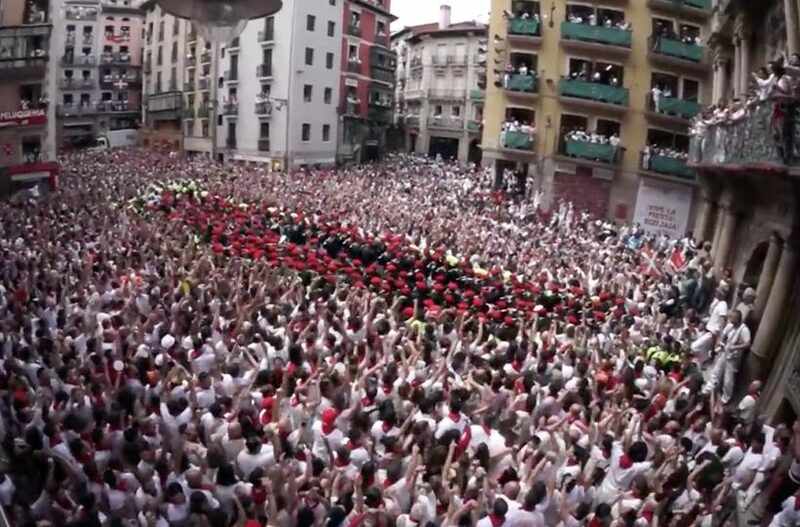 And that’s just for the other 356 days of the year…you should see it during San Fermin! Of course things can go wrong and tragedies happen, but generally speaking things stay remarkably safe and steady during fiesta, despite the insobriety and insanity that goes on all around. This can be down to many things, but I’ll just name a few. The Authorities: Fiesta is superbly planned, well policed and beautifully varied, while chaos and anarchy actually reign. Tolerance: you can be wild and crazy and party like it’s the end of the world…but there are limits. People will accept accidents and incidents but not violence or buttholeness. Bill Hillman, again in ‘Mozos’ said: ‘Fiesta is a peaceful insanity.’ Perfect. So don’t be an arse. Sarah Spicehandler gave me a great title for an article when she said, “Pamplona is like a summer camp for lunatics.” Beautifully put, but please remember, it doesn’t give you a licence to upset your hosts. And finally, and happily: Alegria, or, in Basque, if I’m correct, Alaitasuna: It just means joyfulness. And happiness, gladness, gaiety, merriment, all of them together…to sum up, all those words mixed together can be made into just two: San Fermin. Or one, and with a capital ‘F’: Fiesta! And that, really, is the crux of it: the letter ‘F.’ Whatever makes up the extraordinary and complex DNA that is Fiesta, it really all comes down to one thing: a man called Fermin. Okay, just to continue the awful puns, here’s my take on how Fiesta has developed in my three plus decades going. Like anyone, I can be opinionated, but I do also tend to see, whatever my personal beliefs and thoughts, the other side of things too. There are usually at least two sides to something, and this is never truer than during the 204 hours of organised madness and misrule that is the Fiesta of San Fermin. So, this posting is going to be mostly different to the usual stories and histories I write about, as I’m going to state what I think about some things that people are talking about, debating, heck, even making laws on. And to make my point, I’ll probably go over the top a little bit, too. I don’t mean to upset, remember, it’s just my view point. And I’m willing to be proved wrong, of course. The ‘beer and goading in the streets’ of the subtitle there is, in this case, mostly pertaining to one thing: the Encierro. And when I write ‘beer’ I don’t just mean alcohol, but peoples general behaviour during the run while under the extra ordinary influence and excitement, anticipation and anxiety the whole thing brings about. As for the ‘goading’ it doesn’t just pertain to people trying to grab or distract the bull. But other things: those who stand at the side on the run to watch. Yes, really, there are those who it appears go into the street just to spectate. Are they really so clueless and useless that they have no idea the danger they are to themselves and others? Those who take selfies…for goodness gormless sake! Call me old fashioned but I loathe selfies. It’s bad enough that every day some people seem to constantly shove their ugly mugs in front of the camera to tell the world, ‘hey, look at me!’ (and it’s the same people, time after time, but guess what? I already know what you bloody look like!) but honestly…doing it during the encierro? Dangerous for you, dangerous for others and you’re a bipedal moron. As many folk are aware, there is always a debate going on about the Encierro, and those that run it, from the extremes of ‘should it actually happen’ to ‘how people should dress.’ More of which in the next badly-punned (and penned?) section. But happen it does so I’ll just say my piece. I’m not going to go into the whole ‘who should be allowed to run and who should not’ thing here, as for the moment, like them or not, they already have rules. I saw two extremely obese young women who could barely waddle, let alone walk, in the streets a few years ago. Running wouldn’t just have been impossible for them, but I doubt they knew what the word meant. Eating, yes, running, no. No, this isn’t one of my forays into fatism coming on, (and I’m usually only joking, anyway) but I’m just using them to highlight a couple of things. One, they were a danger to themselves and to others around them. If they had been allowed to climb through the fences by the police, (and I really don’t think they could have fitted through the barriers, honestly) then the cops must have missed them. If they’d been in the street all the time, then I hope, for their sakes and others that they were among those told to leave. Perhaps they were heading to the doorway of a friends flat to watch it from. I hope so. And yet…I know several runners who have spent decades running and have earnt their stripes and more, but who now don’t find it as easy to run like they used to, if at all… But there they are, in the streets, reliving the old days, perhaps dreaming that dream of one last, final, beautiful run, or just needing to be there. Would I chuck these people out? Never. They have run for years and have earnt the right to be there, but now can’t run any more due to age or injury, while some people have youth on their side but can barely bloody walk, let alone run, and it’s them I hope would be asked to leave. So that’s me a hypocrite I suppose but I don’t know what the answer is. As for people who actually can run, their behaviour can still be pretty bad. When Bill Hillman got gored a couple of years ago near the tunnel, I saw on the tele (and I’m only judging what I saw, I do know Bill and he’s a good friend, but don’t know the three people I’m about to mention or their story) how these three appeared to be congregating near the entrance to the tunnel, seeming to be, and get this…waiting, yes waiting for the bulls to arrive. Not running, but waiting…lordy lordy, for the love of… That’s worse than spectating at the side of the street, I think. Waiting, at one of the fastest, narrowest and most dangerous parts of the course. Brainless bipeds. And, when the danger did approach, one of them completely lost it, pure fear took over, cowardice perhaps, and only then did he decide to run…directly across the entrance to the tunnel and the oncoming crowd, completely wiping out a well-known and experienced runner. Honestly, you couldn’t make it up. A case of Fear Imploding in Pamplona, perhaps. Bipedal idiots. Hopefully they’ve learnt their lesson. And, and, AND! They were wearing English football club tops, (I’m English by the way and know the club and they play in blue) …and the wearing of football and sports tops is something which many folk know I’ve mentioned before (it’s just a ‘me’ thing) and is something I generally can’t stand. Which, contrarily, made it easy to spot these three mindless muppets. But again, I generally don’t like the constant wearing of sports tops, and not just in fiesta…but anywhere! Now and again, of course, fine…but for some it seems to be every day. But I know this is one point many people won’t like, but it’s just how I feel. And some of my favourite people on the planet wear them of course, so I guess I’m on a hiding to nothing here! Which brings me on to the next section. And it’s not just some bipedal retards and their bull run selfies, either (it’s so bull-dumpingly obvious: do NOT take a selfie during the run!) but the use of Go-pro and even drones, and the making of films and documentaries, or books or articles supposedly about the fiesta…but so often really about themselves. Dispiriting, and a shame. Yup, things won’t change I guess, and as one great runner of decades standing who I respect greatly wrote to me, ‘Tim, if you think it will change, then you’re just peeing in the wind…’ and he was so right, of course, but it doesn’t mean I can’t have my say, and this, for me, is a very, very rare thing: me writing, not the usual histories and stories, but for once really giving my opinions. But there is a serious point to this. There has been another debate running (boom boom) alongside and within the encierro one and things related to it, about what people are wearing during the run. Many comments have been made about how ‘multi-coloured’ the run is, and no, they’re not talking about the number of immigrants or foreigners here, but what they’re wearing. Not just coloured football tops, but coloured tops of all sorts of styles and things, companies, sports clubs, colleges, universities, concerts, advertising…anything. There’s talk about trying to return the run to how it ‘traditionally’ was…with everyone running in whites. But, hang on a minute…much as I love it, and would like to see a return to it, running in only whites is hardly ‘tradition.’ Check out the old photos and film, and if ‘tradition’ is running in whites, then that’s been, very roughly, the case for only about 40 years. Ish. Very, very, ish! If people want the run to be ran in ‘traditional’ clothes, then they might as well tell everyone to run in their everyday clothing, be it casual wear, (yes, those awful football tops again) or the suits or whatever they’d be wearing for going to work. See? It’s safer in whites…! And I know some people wear certain things so they can spot themselves (and be spotted too, let’s face it) easily in the photos and television footage, but please…if you’re good enough, you’ll be seen. And if you’re not, no amount of Mickey Mouse football top is going to change that. And yet, again, those three bipedal burks standing (‘cos they sure as hell weren’t running) in their blue football tops sure made it a doddle for us to see them. Yes, I know many people in Pamplona who wear these things and they are top, top folk who I respect to the max and I have some wonderful friends amongst them – or maybe now, that should read ‘had!’ but it’s just the way I feel. Lo siento chicos! This may sound hypocritical coming from someone known for wearing a bright green peña style ‘blusa,’ but that’s the point…it’s something typical to Pamplona, the peñas and fiesta. And I bought it back in ’84 when I knew almost nothing about these clubs, their colours or what they were. I just liked the colour green and it was my souvenir for myself from a place I knew had changed my life forever. I was once accused of wearing it so I could be seen and spot myself in the run. This in the days, remember, when you had one TV station filming with far fewer cameras on the street, a couple of papers with black and white photos, and, unless you wanted to go for a walk, just a couple of photo shops in the square! Not the over-the-top media vomit-spread coverage of today. For example, there’s a ‘new’ (to me) media tele company appeared the last couple of years in fiesta whose Pamplona program is a true spew show and sums up for me everything that is truly awful about the way some coverage is going in this day and age. I digressed, back to the jacket: Plus, I was generally a pretty poor runner, though not always, and the neon nuclear green highlighted this, not hid it! See, it’s very tricky, isn’t it? Obviously, times change and things move on. They also come back into fashion, too, so maybe the wearing of whites will be popular once again. For want of anything better, the fiesta ‘colour’ is red and white now, of course, and not just the encierro, and I love that. Best of both worlds? A multi-coloured whiteout. The red and white only really began with the formation of a now defunct peña called La Veleta, back in 1929, which I wrote about HERE Back In The High Life’ and you can find under the ‘Heavenly Peña’ section, about halfway down. A ‘white clothing only’ rule would certainly help to keep the numbers down, of course, at least for a while…but remember, it is a free event, generally open to all, if you’re over 18, and is not, whatever people say or think, a professional sports event that only highly trained professionals can partake in. It is not, either, never has been and I hope never will be…an ‘elite’ event only for ‘elite athletes’, or for people who are so-called and self-described ‘experts.’ Some of whom are still, quite frankly, ‘new’ in town. And so, on to another of my bull running bugbears. I know, I know…but it’s the last bit of all this literary plagiarism and punnery, and I only use them as subtitles to make the points I want to make. And really, I am not in fear or indeed in loathing of what I’m about to write about, rather just worried about a trend I don’t really like. The Encierro is beyond special, and yes, it can be dangerous and thrilling and crazy and spiritual. It can also be life affirming as well as deadly, fun as well as fatal, and terrific as well as terrifying. And I know there is a special bond between some runners, and rightly so. But it is not an exclusive event that only the highly trained and superhuman are allowed to participate in. There’s been an ever growing tendency these last few years for people to describe themselves as an ‘elite,’ or ‘experts’ or ‘professionals’ or gawd knows what else when it comes to bull running. Some of them talk about themselves and their friends as if they’re part of some special forces group, engaged on some dangerous and secretive mission to protect the rest of us from a hidden enemy. No, you’re not. You doing the bull run. Anyone, within certain parameters, can do it. They might not be as good as you, but that’s how it’s always been. You’re not special forces. The Special Forces are special forces. You’re bull runners, and some of you are good, very good, and I admire the heck out of you…but do you have to go on and on and on about it? The constant posting of pictures…enough already! And as for the videos, great…but do you have to say, ‘and that’s me at minute 1.20, and again at minute 1.32…’ Honestly. And finally, for those of you who have stuck with me: The language. Go on, try and learn Spanish, folks. I know people who have been going for a few years, longer, even forever…who just don’t speak the lingo. Come on, folkeros…no one expects you to learn it fluently, (and I understand some people just ‘can’t’ learn a language, there is some kind of cerebral dyslexia going on there – I have it with computers) but I know some folk have no intention of ever learning it. You’re in a foreign place that you profess to love, amongst some pretty amazing and wonderful locals…and you don’t even attempt to learn the lingo! Some people seem to think they’re great buddies and on a complete understanding with their fellow local, Navarran, Basque or Spanish, whatever Sanferminer or runner…but they’re not. And you never will be, because you don’t really know each other. Same goes with fiesta folk in general…if you don’t learn the lingo, you’re missing out, big time. And I know, ‘cos I learnt it, and it takes you to a whole different level of fiesta, honestly. There was talk about the universe and galaxies earlier. Well, trust me, if you can learn the language you’ll be sucked through a black hole, (but its lined with red and white solar flashes) to another world. The corks pop louder, the laughs are funnier and the champagne tastes better. ¡Confia en mi! Fiesta! Where it rains champagne. Oh, one final thing while I’m at it, and this is becoming a plague in Pamplona. I search google for many of the fiesta images I use, and am surprised at just how many photos there are of women baring their (and I’m going to use an English joke term here) ‘bristols.’ I was going to use two pictures here, one of a woman with a bottle of champagne on July 6th, and another of a woman ‘flashing her rack’ as they say. But ‘censored’ obviously. I was going to label the first one ‘classy’ and the other one ‘trashy.’ But I’ve decided not to, just in case the girl in the trashy photo could be identified and was embarrassed by her behaviour. Yup, it’s that plague of some women, and their strange need to expose themselves in public, especially in fiesta. Don’t do it please, it’s sluttish behaviour. And guys, don’t encourage them, it’s nobbish behaviour. ‘Nuff said. I’m willing to be proved wrong on anything I’ve written about so far…but not this. If you disagree with me, (and remember, while all this crass exhibitionism is going on, there can be children around) tough, I’m not compromising on this one because I’m right, you’re wrong, it shows a total lack of class and there is nothing, nothing, NOTHING that will ever change that. There. Done and dusted. My apologies it’s not my usual fare, but the last 5 years it seems every man and his pitbull have had their say in books, film, documentaries, blogs, social media and no doubt smoke signals. So from this Sanferminero, that’s my two pesetas worth. As I finish this it’s early morning on June 6th. In exactly one month the greatest Fiesta on Earth will soon be beginning, and for those of us who are going, we are very, very lucky people. I thank my lucky stars that my folks once bought a book called ‘The Drifters’ by James Michener, because I never truly believed the Pamplona chapter, so I had to come and see myself. And I came, and I saw, and I’ve never looked back. I love you Pamplonicans, and I love you Pamplona…and I still don’t bull-oody believe it! Okay, that’s all folks, now back to my normal style, and some sad news about a special and original Sanferminero. I told a few friends, and whereas normally we’d be in front of the Town Hall with the masses, or perhaps at the Lost Peñas’ spot in the gutter in the Plaza del Castillo, awaiting the Pobre-De-Mi, the hour or so before found us at Bar Goal on Jarauta, ready to see the lights of the old Fiesta flicker out and the seedlings of the new one planted for the next year. By seeing someone called El Guti. When we got to where I was told he’d be, there were already perhaps a couple of hundred people there. They were nearly all middle aged or older…or just, in fact, old! But there was that fiesta fizzle in the air, when you know something special is about to happen. I know, I know, I’m not that far off from heading out to the Sanferstreets with my red cardigan on, either. Except yup, it’d be a bright green one. The crowd got bigger, maybe about 400 hundred folk were there, and then at about five to midnight this man arrived, carrying a baton and wearing a funny jacket with a funny hat, and a funny moustache. He looked funny. And fun, too, really fun, he just had that aura about him of letting everyone know…you’re not just going to enjoy this, you’re going to be the most important part about it. Because there’s no point in having some singing without some singers. And we 400 were the singers. The Chorus. And so it began. El Guti was up there on the fountain conducting, a small band of his friends played the music, and as midnight struck the last fluttering heartbeats of the Fiesta Vieja were sung out as the fledgling heartbeats of the Fiesta Nueva were sung in. It was gentle and wonderful and all rather touching and I saw him several times over the next few years and always wanted to meet him, but it was not to be. He died old-ish but still too young, this May aged 73. But that first year was extra special and for the next half hour or so, as The El Guti Pobre-De-Mi played out, (and I should have known better of course,) I marvelled once more at the capacity Fiesta still had to hit that spot and surprise, move and humble me. San Fermin, you sentimental old saint, gracias. And thank you, El Guti, you deserve your spot up there sitting at La Mesa de Los Miticos de Fiesta.